I didn’t take any complicated handcraft to Madagascar. I wasn’t sure that cross-stitch or knitting a bus was an objective possibility. Then there is the issue of dust, stains and sudden stops which could involve a colored food or beverage item. It just seemed safe to focus on something with an extremely limited number of colors. All of which explains why I hadn’t made a lot of progress on Lou in the last month. I pulled it back out after we returned home then couldn’t find the floss which I had carefully stored. A trip to JoAnn’s solved that problem which meant, of course, that a day later I was organizing in the bedroom and “noticed” the box sitting square in the middle of the dresser. The obvious box into which I had carefully placed floss, needles, scissors and chart. Go figure, right? But I can always use extra thread. 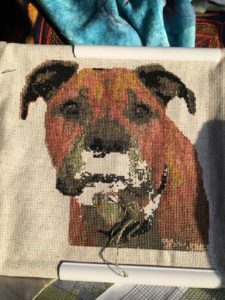 Any way, as of this evening, between stints of stitching and audiobook – I have come this far.